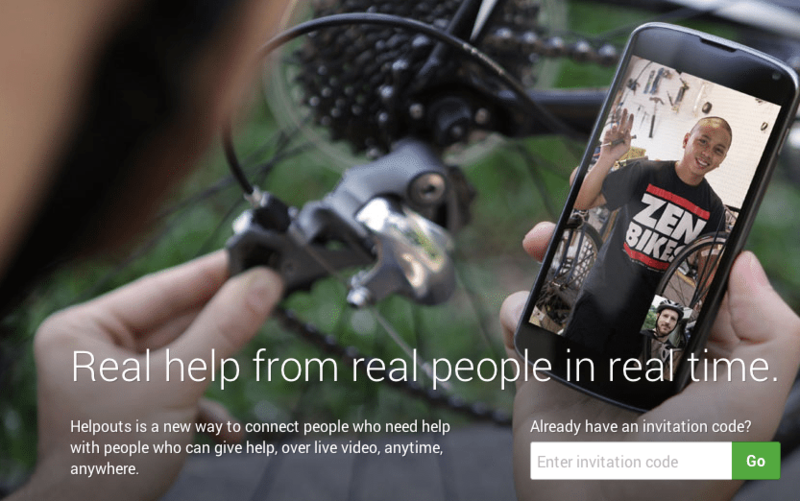 A new service being developed by Google that will allow users to charge others for on-demand advice via live video could be a good tool for a fee-for-service real estate model. The new offering, Helpouts, brings up an old question: Will technology ever change the traditional, 5 to 6 percent commission residential real estate business model with a consultant-like one? With the abundance of information that sites like Zillow, Trulia, Redfin and multiple listing services (MLS) make available to consumers, homebuyers and sellers who want to do some legwork themselves could save bunches with the pricing model popular in other professions like law and medicine. Technology like Google’s new Helpouts tool could help real estate agents deliver services on an as-needed basis. In the traditional real estate model, agents earn approximately 5 percent of the sale price of a home (according to data in last year’s earnings report from real estate giant Realogy), which typically split by the buyer’s and seller’s agents. Source: Realogy’s 2012 earnings report filed with the U.S. Securities and Exchange Commission. A handful of firms across the U.S. operate a consultant-like real estate model, offering consumers a menu of services at set prices, but it hasn’t taken off like some thought it might. Inspired by the 2001 book “Real Estate á la Carte” by Julie Garton-Good, McClure researched the business model a few years ago, but despite his feeling that it made sense, he came to the conclusion that the demand just wasn’t there for it to work and he held off from implementing it. As the younger, do-it-yourself generation comes of age, McClure — referencing an MTV exec’s post on marketing to its millennial audience in the Harvard Business Review — says he expects that the model will pick up steam. Jay Thompson, who ran a Phoenix-based brokerage before joining Zillow as director of industry outreach and social media last year, tried implementing a fee-for-service model at the brokerage five years ago. But after a limited run, he had to can it because it didn’t make the firm any money. “It sounds good on paper, but it didn’t work at all,” Thompson told Inman News. The model, which the firm rolled out alongside its traditional model, however, saw some minor success with sellers who, for a discounted commission fee, would do some of the marketing work themselves on the home they wanted to sell like take their own photos or make their own fliers, Thompson said. “The agent down the street says he’ll show a client 500 homes for free,” Thompson said, and so the firm would lose buyers. Also, Thompson felt that the brokerage’s brand took a hit as consumers began thinking of the brokerage as a discounter, which wasn’t the way he wanted to market the firm or the model, Thompson said. However, if the model became more popular, if people understood it better, and if there were some sort of task-management system that easily tracked what agents did and allowed them to bill easier, it might take off, Thompson said. Garton-Good, who wrote “Real Estate á la Carte,” the book that inspired McClure to investigate the model, told Inman News that she counsels brokers to consider unbundling their services. She has made up a list of 240 items that breaks down what agents do and helps them think about monetizing their tasks — like putting a listing into the MLS or researching a homeowners association fee or a zoning fee. Screen shot of itemized real estate services Julie Garton-Good provides to real estate clients to help them price out their real estate services. “Brokers don’t seem to be the best businesspeople,” Garton-Good said. If brokers were better businesspeople, if they were to “drill down into what they do and determine how long it takes and what it’s worth,” the fee-for-service model would be more prevalent, she said. “Without some outside family assistance,” Wendel said, the brokerage, which averages about 10 clients a year, would’ve folded by now, several times. 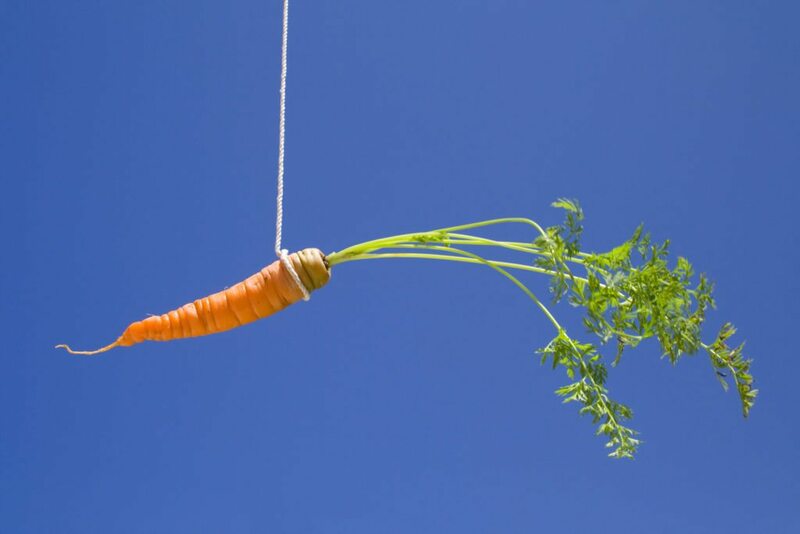 The most popular pricing model at the firm, which focuses almost exclusively on buyers, includes an upfront “retainer” fee of $500 and a $100 fee for each hour worked, billed in 15-minute increments in exchange for a 100 percent buyer rebate (See option 3 on this page). Wendel believes in the model because, by collecting an upfront fee, it helps him earn money on agency relationships that don’t result in a sale and saves money for clients who do complete a transaction with him. With an upfront fee, Wendel said, clients pay down his risk of not getting paid if they don’t buy or sell a property. Because they take on that risk, if they do complete a transaction with him, they get more money in their pocket than they would have in a traditional real estate transaction, he said. 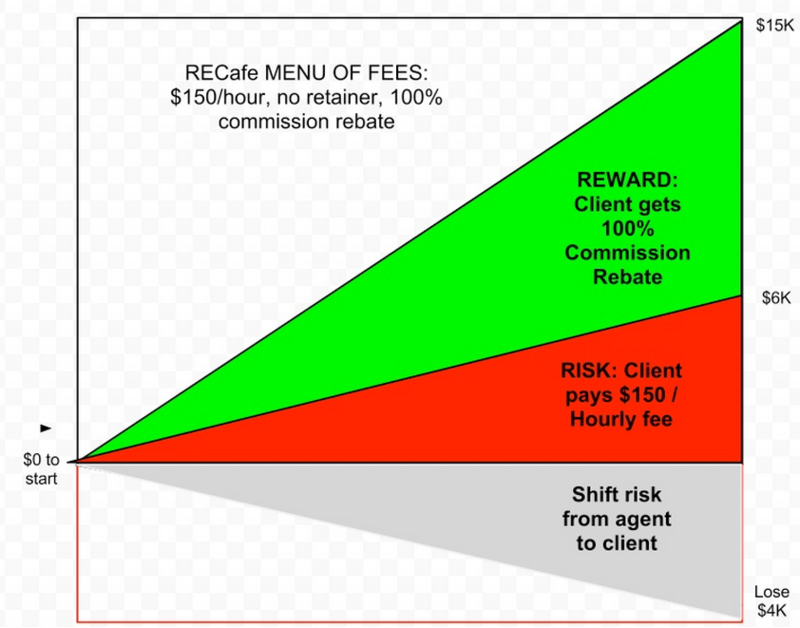 Graph from Bill Wendel that displays his client risk-retention theory that’s behind his fee-for-service real estate model. Self-service clients tend to be overly critical of fees, which complicates the billing process. To make a living on smaller margins, it’s important to do a higher volume of business, which can be challenging to drum up. There’s a general lack of awareness about the model among buyers and sellers. “Change takes place slowly,” Wendel said. Wendel says he has plans to experiment with the model going forward to see if he can find a way to make it profitable. For example, he has plans to pick six weeks a year where he’ll work for a percentage of the savings he generates for clients on a transaction. Rhonda Duffy, a broker in Atlanta who runs Duffy Realty of Atlanta, says she has had a lot of success in a fee-for-service model since she implemented it 12 years ago. In Duffy’s model, which she says she’s licensed to 57 other brokerages in the U.S., sellers pay a fee of $500 upfront and 0.34 percent of the sale price with the option to purchase a professional photography package for $94 and an electronic lockbox rental for a one-time fee of $100. The one-time listing fee pays to get the listing in the MLS and for enhanced placement on realtor.com, Zillow, Trulia and other sites. Buyers with Duffy receive a refund of $500 on properties of $100,000 or more and when the buyer’s agent’s commission is at least 3 percent. On homes that go for less than $100,000 or the buyer’s agent’s commission is less than 3 percent, buyers receive $150. Echoing Wendel, Duffy says that the upfront fee she gets from sellers allows her to charge a lower commission. She doesn’t have to overcharge clients to make up for work she does on listings that don’t sell by charging what she considers to be a high commission — the traditional 2.5 to 3 percent. Many agents sell one property for every six listings they take, Duffy said. Duffy’s brokerage, which has 40 buyer’s agents and five listing agents, currently has 325 buyers under contract, 640 active listings and 318 listings under contract, according to Duffy. Those boundaries help Duffy and her clients progress smoothly to a completed transaction, she said. “Most brokerages overservice their clients,” Duffy said. For example, in the 14,000 transactions her firm’s represented clients on, Duffy said she’s been to only one closing. Duffy will work on a traditional commission structure if clients really want it, but has done only three in her 12 years running her brokerage. “The first year I was in business, I was making money,” Crawford said. He attributes that success to a real estate business model that differentiates him from other firms based on price not on connections. Crawford’s business setup, which is currently focused on sellers, is modeled after Duffy’s. It features a flat fee of $500 to list a property in the MLS, realtor.com, Zillow, Trulia and other sites, and 1/2 of 1 percent commission on any transaction. To prevent confusion and to maintain a consistent brand, he doesn’t offer and won’t work on a traditional commission model. Compared to a 6 percent commission model, Crawford says he saves sellers $7,800 on average. Crawford advertises his firm as full-service, because he’s willing to do anything for a client, for an extra fee. For example, the firm will hold an open house but charges a seller extra for it. Unlike Duffy, almost all of Crawford’s business comes from the listing side, and while he will do itemized fee-for-service plans for clients, he prefers not to. “We don’t have a services list,” he said. Billing for itemized services “eats up a lot of our time.” However, if clients ask for it, he’ll do customized billing. Michael Hamby, a top-producing listing agent with Champion Realty in Annapolis, Md., says that the traditional real estate model is here to stay. In 2013, Hamby says he’s on track to complete transactions on 40 listings. He and his partner will close $38 million in business this year, he said. Hamby attributes his success to the vested interest he has with a home seller or buyer on a real estate deal. He gets paid, he says, only if he sees a transaction through to closing, so it incentivizes him to be smart about which clients he works with and to work hard to close a deal for those he does. Hamby sells approximately 94 percent of those properties he lists, he said, because he insists on working with clients who will let him do his work as a professional. “I haven’t taken a photo in years,” Hamby said. His services include professional photography, professional graphic design, and he also takes on the less monetizable roles of consultant and therapist. Data supplied by two MLSs — Sunnyvale, Calif.-based MLSListings Inc. and Rockville, Md.-based Metropolitan Regional Information Systems Inc. (MRIS) — shows that about 70 percent of the properties listed for sale actually sell. Data from another MLS, Atlanta-based Georgia MLS (GAMLS), shows that approximately 53 percent of the properties listed for sale in its database in 2012, sold — still far from Duffy’s approximation, but still a low enough ratio to lend some weight to her and Wendel’s risk-retention reasoning for their fee-for-service operations. This data puts Hamby at the upper range of the sale-ratio spectrum and way above the low agent list-to-sale ratio that Wendel and Duffy say inspired their upfront fee models. That approach ensures that he doesn’t lose money with partnerships that don’t work out. This full-service, traditional model, Hamby said, allows him to maximize the price his sellers get and ensure his buyers get the best price.